Posted on Thu, Mar 15, 2012 : 2:18 p.m. The state fire protection grant payment to Ann Arbor this year amounts to a little more than $1 million, down 10.6 percent from the year before and nowhere near the $2.2 million called for in the funding formula, which is based on the amount of state-owned property in the city. Ann Arbor, home to the University of Michigan, is one of four communities in the state underfunded by six figures or more when it comes to state fire protection grants. That's been a sore point for city officials for years, and Ann Arbor's lobbyist in Lansing is hoping this can be the year that state lawmakers do something about it. "I would say it's time to respond fully to this obligation," said Kirk Profit, a lobbyist for the cities of Ann Arbor and Ypsilanti. "It's the law of the state that the state will pay for the fire protection services for these state assets in these communities." Under a law passed by the Legislature in the 1970s, the state is required to reimburse local municipalities like Ann Arbor for the fire protection services they provide for state facilities like universities and prisons, which don't pay property taxes. Kirk Profit, who lobbies in Lansing on behalf of Ann Arbor and Ypsilanti, said he's working hard to get full funding for state fire protection grants. Historically, funding for the grants has come from liquor taxes, and more recently from the state's driver responsibility fees. But the state has been diverting money to other competing interests for years now, leaving the grant program significantly underfunded, Profit said. Collectively across the entire state of Michigan, the formula calls for doling out $21 million in fire protection grants to more than 60 municipalities, but only $10.2 million is being delivered by the state this fiscal year. That's down 6.1 percent from the previous year, records show. Detroit should be getting $6.2 million but is getting less than $3 million. Lansing and East Lansing each should be getting $2.4 million but are getting less than $1.2 million. Republican Gov. Rick Snyder has proposed a budget plan that would drop fire protection grant funding to $8.5 million for the state's next fiscal year starting Oct. 1. That would come entirely from the state's driver responsibility fees, which have been diminished and are being considered for further cuts in Lansing. Profit said it's a particularly bad situation for distressed cities like Ypsilanti. On top of its own budget worries, Ypsilanti is responsible for providing fire services for Eastern Michigan University, but the state is meeting less than half its $942,381 obligation to the city. "Here you've got Eastern Michigan University, which has a regional benefit beyond the city of Ypsilanti," Profit said. "You probably wouldn't pick the most distressed community in the region and say, 'Let's put the fire protection duty on them.' "
Records show Ypsilanti spent $2.9 million on fire protection services last year, while Ann Arbor spent $13.8 million. 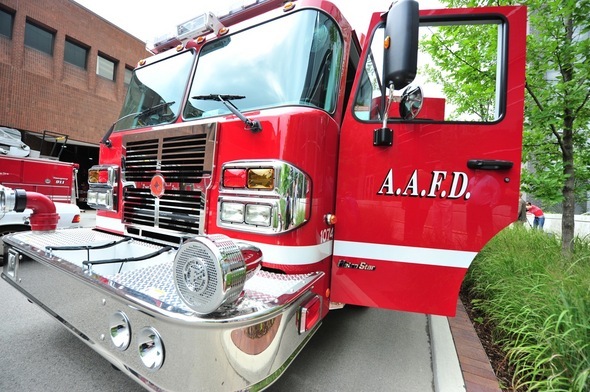 With dwindling staffing levels in the Ann Arbor Fire Department, Ann Arbor officials are considering closing two fire stations by July 1 to more efficiently concentrate the city's reduced resources. The department has seen deep cuts in recent years because of a lack of money. 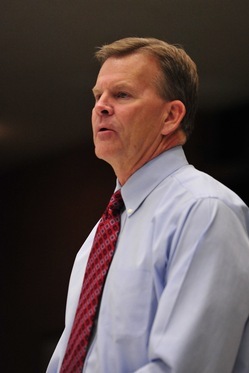 Fire Chief Chuck Hubbard said this week the reorganization plan he's proposing will allow the city to better serve properties and facilities owned by the University of Michigan, but he said he isn't making a pitch to get the university to start paying for fire services. City Council Member Stephen Kunselman, D-3rd Ward, said maybe the city's lobbyists should take that information to the state. "Based on this new model, the U of M facilities are going to be much more covered," Kunselman noted at Monday's council meeting. While U-M has never offered to make up for the state's lack of funding for fire protection grants, U-M is a partner in the fight to raise funding levels. Ann Arbor's Fire Station 3 at 2130 Jackson Ave. is one of three fire stations that could close by July 1, while another one reopens, for a net loss of two stations. Spokesman Jim Kosteva said U-M has joined efforts with other host communities and schools, including EMU, in advocating for more funding, and getting access to some of the funds from the state's so-called "bad driver fines" was one successful result of those efforts. "Otherwise the fund would be lower still, just like all statutory revenue sharing has fallen," Kosteva said. "It's largely a matter of trying to re-slice a pie of limited funds and it puts communities with state facilities against other interests." Kosteva, who served in the Michigan House of Representatives from 1985 to 1992, said the state's fire protection grants have never been fully funded in their 30-plus years. Historically, he said, it has been in the low- to mid-40s in terms of percentage funded. 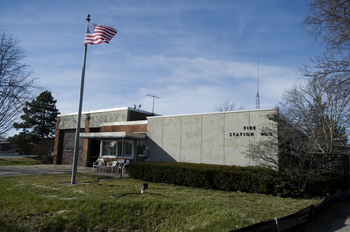 Kosteva noted Station 5 — one of three Ann Arbor fire stations that would remain in service under the chief's reorganization plan — is provided by U-M at no cost to the city. The university provides all utilities, performs all maintenance and charges no rent, and Kosteva estimated that represents a value of more than $225,000 each year. Profit said he's working hard to convince Republican lawmakers to rethink the governor's strategy and instead increase funding for fire protection grants. He said many Democrats like local state Reps. Jeff Irwin and David Rutledge, as well as Sen. Rebekah Warren, D-Ann Arbor, already are supportive of bringing up the funding levels, but now the challenge is convincing GOP lawmakers in other parts of the state. Profit said he's working cooperatively on the issue with state Reps. Frank Foster, R-Pellston, and Mark Ouimet, R-Scio Township, and a number of U.P. legislators. "I know we can put forward a good case and we're going to have to see how we fare in the budget process over the next several months," he said. Profit said it strikes him that if the state can find new money for public safety, something Snyder is proposing, it also can take care of existing obligations for fire protection. The Michigan Department of Licensing and Regulatory Affairs, known as LARA, oversees the state's Bureau of Fire Services. Mario Morrow, a spokesman for LARA, said the finance departments of LARA and the bureau work together to administer the grant program, but the earmarks for each fire department are determined by the governor's office. "We just know we have an allocated amount in the governor's budget that comes our way and we have to work within our means we're given," he said. Asked how the governor can find new funding for public safety initiatives but not new funding to meet existing obligations like fire protection grants, Morrow said that's a fair question. And he said cities are absolutely right to point out they're not getting the full allocations the state's funding formula calls for, but an answer to that problem isn't readily apparent. "The grant isn't being fully funded," he said. "We're faced with the fiscal and financial realities of the current time of our state and we're trying to be fiscally responsible across the board and just trying to do the best we can with what we have to work with." Tom Crawford, Ann Arbor's chief financial officer, said he'll be closely watching as the state budget talks play out in Lansing. "One of the things I'm watching is the state fire protection grants," Crawford told council members this week. "They have not funded that fully in a number of years — I don't even know when the last time was, and there's some significant opportunity in that." Profit recalled state funding for the fire protection grants has varied over the years — anywhere from $3 million to $10 million. When John Engler was governor, he actually tried to veto the entire program, but the Legislature had to override him. Ann Arbor Mayor John Hieftje told AnnArbor.com this week he has no expectations the state will fully fund the program anytime soon. But he said while it appears the state can choose to ignore its obligations to fund the grants, the city can't stop providing fire services to U-M.
Fri, Mar 16, 2012 : 4:20 p.m.
Fri, Mar 16, 2012 : 11:46 a.m. I think we have gone to far down the grant road. We expect grants but forget they are paid from tax money WE have paid. All grants have strings staff time and on how it is spent and report requirements that eat money. It would be better to keep our funding, spend it how we like, and know how much money we willl have. Perhaps city's in poverty should get some assistance from the state, but Ann Arbor, really? Fri, Mar 16, 2012 : 11:44 a.m.
Fri, Mar 16, 2012 : 2:55 a.m. Translation the state shorted us $1.2 million, but our lobbyist at GCSI, can't get the votes to make them pay up. Rather than crying over what we can't change, let change what we do control. The scientific national standard for best practices in fire safety includes the ability to get four firefighters to 90% of all fires within four minutes. It comes down to this with the 2013 fiscal year budget, do you want: A. $1.4 million added to the rainy day fund with 76 firefighters operating from three fire stations who can get to 72 percent of all fires with four firefighters in four minutes, OR B. $200,000 added to the rainy day fund with 88 firefighters operating from five fire stations able to get to 90 percent of all fires with four firefighters in four minutes. The chief says that he really needs B, but the Mayor wants to give us A. I vote for &quot;Plan B&quot;!! Do you?? Fri, Mar 16, 2012 : 6:37 a.m.
Fri, Mar 16, 2012 : 1:24 a.m. The lessons of history are the ones we are NOT supposed to forget. Lets pray that there's not a fire causing multiple deaths to PROVE that Republicans like $nyder FORGET those lessons all the time. The word for the remedy is: RECALL. Fri, Mar 16, 2012 : 1:49 a.m.
Just like the way the Governor and his new Corrections Director just changed the Civil Service rules and got rid of the armed perimeter vehicle found at state prisons to &quot;reduce cost&quot;. A very dangerous idea that was not thought out very well at all. Sounds like the state has an art fund taking away from the fire protection fund. Oh my. Thu, Mar 15, 2012 : 9:13 p.m.
Just one more reason to be disgusted with our governor! Thu, Mar 15, 2012 : 9:31 p.m.
&quot;That's been a sore point for city officials for years&quot; &quot;the state has been diverting money to other competing interests for years now&quot; &quot;They have not funded that fully in a number of years&quot; &quot;Engler... tried to veto the entire program&quot; Clearly the work of that arch-villain Snidely Whiplash. Perhaps the state looks to assist communities with more drastic fiscal problems for rather than communities far better off that tend to spend extravagant amounts on non essential fluff. Thu, Mar 15, 2012 : 9 p.m. Speaking of fire protection, is that brand new fire engine in the picture in service yet? Thu, Mar 15, 2012 : 8:39 p.m. Please note I added comments from Mario Morrow, director of communications for the Michigan Department of Licensing and Regulatory Affairs, to the story. Thu, Mar 15, 2012 : 8:21 p.m. Same old, same old. ART is not the problem Several articles here and even an editorial have pointed that that the funding that goes to art could not ever have been used to fund the fire department or the police department. The parking structure? It will mostly be paid for using parking fees, not general fund dollars, money that does not yet exist. (The city already gets a big cut for the general fund.) The rest is DDA dollars for infrastructure that by state statute must be spent in the downtown. The new structure was the very best thing they could have done to keep downtown viable. Again, this funding was never in the general fund from which police and fire are paid. One commenter said it best. It doesn't matter how much the state gives, the city will just steal it. Meaning, they dump it into the general fund and continue to cut the fire budget. It's for fire services rendered to the U. Not Police, parks, rivers, only fire. But we never see it. If this city was so 'transparent' they would have a police and fire millage like most cities do. But they wouldn't want to do that because they like to play games with the general fund. Here's a perfect example.... Heiftje said in his last budget meeting that even though personnel are being reduced, the percentage that police and fire take from the general fund is increasing. Here's what he's doing. Over the past couple of years they've moved certain department budgets out of the general fund into their own 'buckets'. If the general fund is $1.00 and 4 groups are part of that all taking $0.25, then each group accounts for 25% of the general fund. Take 2 groups out and only leave police and fire. Now the new budget is $0.50 because 2 groups have their own bucket. Fancy math now tells you that police and fire JUMPED up to ***50%*** of the general fund EACH! My god! from 25% to 50%?!?!?! Our mayor is playing on the fact that most residents will take what he says as gospel and never question him. Fri, Mar 16, 2012 : 2:49 p.m.
Thu, Mar 15, 2012 : 8:07 p.m.
Thu, Mar 15, 2012 : 7:33 p.m. The university should be ashamed at how they &quot;maintain Fire Station 5&quot; it is like a slum the worst in the city. They have poor facilities all around the U cuts the grass and pays utilities I dont believe that amounts to $225,000 . I commend the firefighters stationed there for living with the sub par conditions for years. My first choice of fire stations to close would be fire station 5 as the drain the U puts on the resources for zero return. However that area has family homes as well so that must be taken into account and they pay taxes for the services. In the year I spent in Ann Arbor it was my experience that if the U said jump the City asked how high. They buy property and take it off the tax roll then they lease it out for less then sites in town who pay taxes. At the least the university needs to build a new state of the art fire facility with modern efficencies and &quot;green&quot; construction. No way does the money from the state come near to the cost of serivces used for fire or police. As the university keeps buying properties soon there will be more geography off the tax rolls than on. Thu, Mar 15, 2012 : 7:31 p.m.
State of Michigan, please pay up so we can buy better art! Thu, Mar 15, 2012 : 7:21 p.m.
And yet we have the haters wanting to blackmail the University to pay up when it's the State's legal obligation to fund fire protection services for UM. Typical. Thu, Mar 15, 2012 : 7:10 p.m.
Why is it that the Police and Fire Department always take the cuts? Because those are areas that when cut, make people vote for more funding. Thu, Mar 15, 2012 : 7:09 p.m.
Not surprising. What can Ann Arbor expect? We've got an art fund which many cities don't have. We've cut safety services. This tells the State that maybe we don't need the money more than someone else and where our priorities lie. Thu, Mar 15, 2012 : 7:04 p.m. If the original agreement was that we will provide services, if you pay us, then if you don't pay us then we don't provide the service. Now, I know that would never happen, but why on earth isn't a bigger stink being made over this??? And how much do we pay Mr. Profit to advocate for more money? Now I forgot, how much was that unneeded ( in my opinion ) underground parking garage?